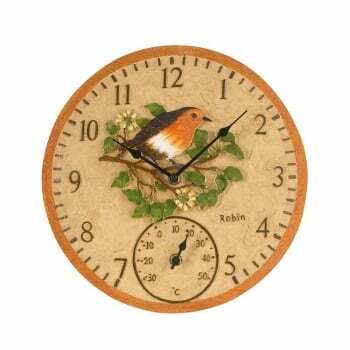 This beautiful hand painted clock & thermometer has a lovely robin design at its centre. It has been created using weatherproof polyresin and has the appearance and weight of ceramic. The thermometer clock is fully weather resistant and can therefore be used inside or outside your home.